Bigelow vanilla chai has a special place in my tea cupboard. I drink a lot of tea, especially in the heart of bitter Wyoming winters that will chill your bones until you cry thinking about spring. As a woman of few luxuries, I keep teas as one of my daily primary pleasures. On hand, there are enough flavors for at least one tea for every mood and time of day imaginable. 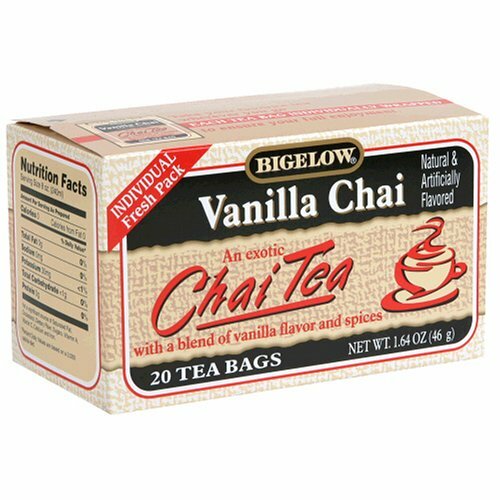 When do I enjoy Bigelow vanilla chai? Every morning I wake up and have to kick myself into gear as quickly as possible. I’m a mother of three, wife, and self-employed bread-winner for the family. I don’t get paid until I can get the rusty gears in my brain to turn relatively efficiently. The result? I suspect I’m a caffeine addict. I’m not a morning person, so I’m a bit picky about my routine. I don’t really want anything sweet – a little bit is okay, but not too extreme – but I do like some flavor to beat the wake-up gong for my taste buds. This is where Bigelow vanilla chai tea comes in. It’s an essential part of my morning routine. What can you expect with Bigelow vanilla chai tea? Vanilla chai is a black tea with various spices, and of course the mysterious “natural and artificial flavors” that every ingredients list seems to have. It is certainly not the finest tea in my arsenal, but it is readily available at the local grocery store. It has a pleasant taste and, perhaps more importantly in the mornings, a very pleasant scent. Put simply, vanilla chai smells about as heavenly in the mornings as a tea possibly can. The flavor is fairly strong, and the caffeine content is nearly as much as a can of coca-cola. It’s not enough to punch you in the gut, but enough to take the edge off of the desire to curl back up in a comfy blanket nest and snooze the day away. This tea goes great with almost any breakfast imaginable, whether it’s pancakes, pop tarts, or a full meal of bacon and hash browns. One exception to the universal pairing is cold cereal – I think Bigelow’s Pomegranate Pizzazz tastes better in that instance. This is one of the few teas where strong tea enthusiasts like myself actually have to pay attention to the brewing time. For most other teas, I’ll leave the tea bag in the cup the entire time I’m drinking that cup. I know it’s a major no-no in the tea world, but I certainly never claimed sophistication. Put simply, you just can’t do that with Bigelow’s vanilla chai. It will get unpleasantly bitter if you let it steep too long. I almost always drink Bigelow vanilla chai tea hot, even in warm weather, because it’s just plain delicious. Add a splash of milk and about a teaspoon of raw honey, and I could drink this stuff all day. That said, it is also quite tasty as an iced tea. It’s a great alternative if you want something smoother and slightly sweeter than orange pekoe, but without adding a ton of sugar or other sweeteners. Bigelow teas are great for us of the “general population” because they’re cheap, they’re readily available, and they offer some of the most popular flavors. A box of 20 individually wrapped teabags retails at the local grocery store for under $4 – in fact, get it at certain low price leaders and you might find the price tag closer to $3. Sure, it’s not as environmentally conscious as single wrapped teabags or loose leaf teas, nor is it likely to satisfy if you’re used to high-end artisan teas, but it’s a prime option for everyday tea drinkers in the average working-class household. Disclosure statement: I have no affiliation with the company or any other representative of this product. Its marketers or other affiliated individuals have not offered compensation for my review. The opinions expressed here are entirely my own.